Anna Marie Bleicher Hodge, 91, passed away peacefully Saturday morning at Barbour Court Nursing Home in Smithfield. Anna was born in Romania on June 10, 1927 to the late Fredrick and Carola Shepherd Bleicher. She was married to the late William R. Hodge. She was a member of Holly Springs Free Will Baptist Church in Kenly. Anna will be remembered as a loving mother, grandmother, sister and friend. Family was important to her, and she lived a life dedicated first to God, but then the well-being of her family. The family will receive friends on Monday, October 8, 2018 from 10:00 a.m. until 10:45 a.m. at Kenly Funeral Service, followed by a service at 11:00 a.m. in the chapel with the Rev. Curtis Jones officiating. Burial will follow the service in the Kenly Cemetery. 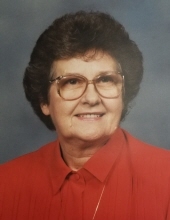 Anna is survived by sons, Glen Hodge of Kenly; Bruce Hodge and wife Cindy of Kenly; Bill Hodge and wife JoAnn of Otto; daughter, Jeanette Abbink and husband Michael of New York; two grandchildren, and two great grandchildren. In addition to her parents and husband, she was preceded in death by her brother Kurt Bleicher. To send flowers or a remembrance gift to the family of Anna Marie Hodge, please visit our Tribute Store. "Email Address" would like to share the life celebration of Anna Marie Hodge. Click on the "link" to go to share a favorite memory or leave a condolence message for the family.